The age-old question, "How many nesting boxes do I need?" The standard is about 1 box per 4 hens. Any chicken keeper might be tempted to tell you just 1 or 2, LOL. Why?! Because everyone wants the same box or the most coveted box anyway! My silly California White and Leghorn ladies displayed this beautifully this morning. Neither was willing to give way and they both decided to just share. Silly things! Chickens and their antics and personalities give me neverending enjoyment. They are such quirky, individual personality characters. Bottom line is, it's better to have the 1 to 4 ratio, but just know that in the end, there will be some that just won't get used, or used very little. 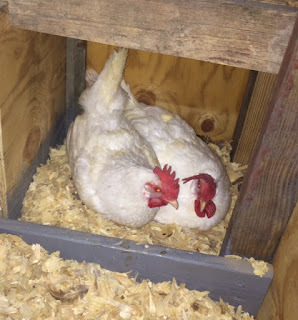 In my main big coop, I have 6 nesting boxes and my currently 20 plus laying hens generally use only 3 of them! What antics are your chicks up to these days?